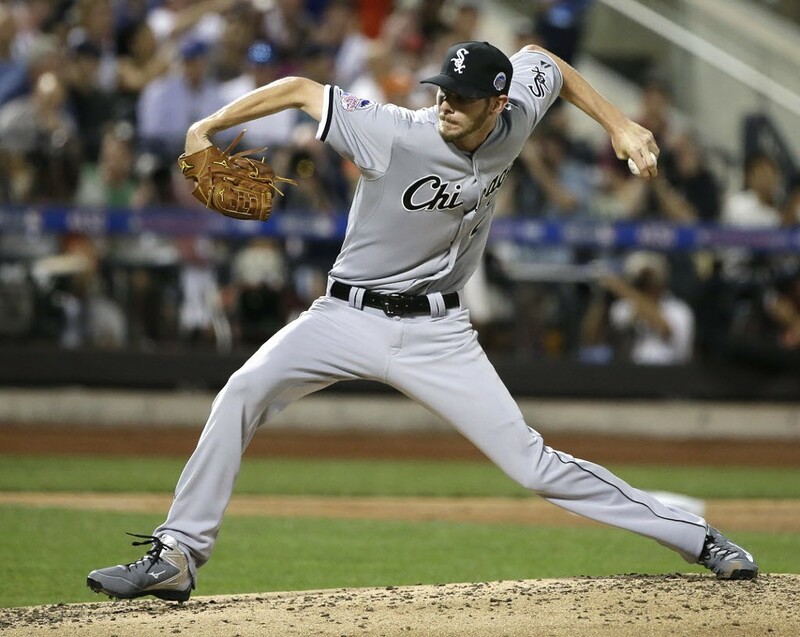 Chris Sale retired all six batters he faced in last night's All-Star Game and was credited with the win. Thanks to the American League's 3-0 win over the National League in last night's All-Star game in New York, the World Series will begin on the south side this October, unless the White Sox happen to be eliminated before then. The Cubs were denied home-field advantage in part by the pitching of gangly Sox southpaw Chris Sale, who got the win at Citi Field. During his two perfect innings, Sale blew away Colorado Rockies sluggers Carlos Gonzalez and Troy Tulowitzki. The Cubs' lone all-star, pitcher Travis Wood, wasn't used, and the other Sox all-star, pitcher Jesse Crain, is nursing a sore shoulder. The Sox will begin the second half at home Friday against the Atlanta Braves. The south-siders are in last, 14 games behind the Detroit Tigers. But the Sox and Tigers still have 16 games against each other, and the Sox only have to win 15 of those to catch Detroit. The Cubs, who open the second half in Colorado Friday, are in fourth place, 15 games behind the Saint Louis Cardinals in the tough NL Central, but a mere 10 games out of a wild card spot. Still, both clubs have changed their motto to Wait Till the Year After Next Year. They've already begun trading veterans for prospects. The Cubs' Matt Garza likely will be dealt soon, and Sox all-star Crain will be gone as soon as his shoulder recovers. The future looks as rosy as ever. All the Sox need is a little hitting, and the Cubs are one Jumbotron away from .500.